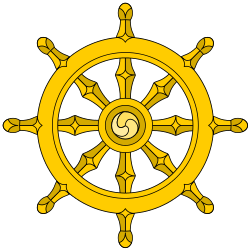 The Majjhima Nikaya (-nikāya; "Collection of Middle-length Discourses") is a Buddhist scripture, the second of the five nikayas, or collections, in the Sutta Pitaka, which is one of the "three baskets" that compose the Pali Tipitaka of Theravada Buddhism. Composed between 3rd century BCE - 2nd century CE. This nikaya consists of 152 discourses attributed to the Buddha and his chief disciples. These are in conformity with the conduct of a Digambara monk. Ultimately, the Buddha abandoned reliance upon these methods on his discovery of a Middle Way. Lord Chalmers, trans. (1898-1926), Further Dialogues of the Buddha, 1926–7, vol.1, vol. 2, London: Pali Text Society. Reprint: Ann Arbor: Books on Demand, University of Michigan. ↑ Upinder Singh. A History of Ancient and Early Medieval India: From the Stone Age to the 12th Century. Pearson. p. 25. ↑ Pruthi, R.K. (2004). Buddhism and Indian Civilization. Discovery Publishing House. p. 197. ISBN 978-81-71418664. Retrieved April 1, 2015. ↑ Jain & Upadhye 2000, p. 58.